Not all fats are created equal! Highly processed, hydrogenated fats which are used in packaged foods are extremely dangerous to our bodies. These bad fats can lead to problems with your immune system, cardiovascular system, and even your behavior and mood. They contribute to weight gain, skin conditions, high blood pressure, and liver damage. Unhealthy fats includes trans-fat and inflammatory vegetable oils. Unfortunately, these fats have increased in our diet as they make us fatter and contribute to inflammation, which plays a role in nearly every chronic disease on the planet. So, Where is the Good Part? Well, our body needs healthy fats for insulation, vitamin and mineral absorption, organ protection, and most importantly for brain health. These fats can steady our metabolism, maintain hormone levels, nourish our skin, hair and nails, and provide lubrication to keep our body functioning properly. 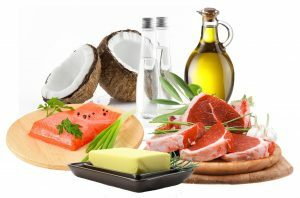 Healthy fat is required for calcium to be effectively incorporated into bone as key bone-building vitamins A, D, E, and K are fat-soluble, meaning they rely on fats to be absorbed and transported within the body. In order to have proper lung function, the airspaces of the lungs have to be coated with a thin layer of lung surfactant, which is 100 percent saturated fatty acids. Your brain is mainly made of fat (60%) and cholesterol (40%). A diet without healthy fats robs your brain of raw materials it needs to function optimally. A diet with healthy fats supports memory and is critical for overall brain function. Certain healthy fats, such as coconut oil and oily fish are necessary for proper nerve function and protection. These nerves influence everything in the body from metabolism and muscle movement to the appropriate release of insulin. There are so many benefits for including more healthy fats into your diet, therefore, it’s important to include a variety of sources as they all offer a variety of benefits. The right fats can improve your mood, skin, and hair, while protecting you against diabetes, dementia, cancer, and much more. Try a new fat today! For cooking at high temperatures (stir frying or baking) use coconut oil. For sautéing, use olive or coconut oil. Use avocado as a wonderful dressing to a salad or a spread on a sandwich. Add a spoonful of coconut oil to a smoothie. Cook eggs in coconut oil for the ultimate healthy fat dish. If you have any questions, contact our office by emailing blossomfamilychiro@gmail.com or calling 727-498-5643.
https://blossomfamilychiropractic.com/wp-content/uploads/2016/09/fats.jpg 972 1472 Tara Bassi https://blossomfamilychiropractic.com/wp-content/uploads/2019/01/blossom-logo-grey-l-1030x216.png Tara Bassi2016-09-26 19:13:332016-09-26 19:21:10Fats: Good or Bad?